The National Gallery Victoria - Melbournes art gallery - is Australias oldest public art gallery. It is just over 150 years old. 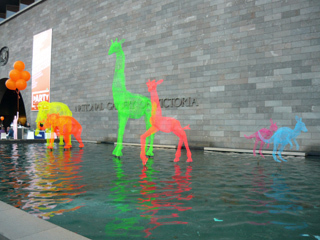 It consists of two buildings, the NGV International Gallery and The Ian Potter Centre, the NVG Australia. Art became an important part of Melbournes life early on. With the riches of the gold rush came an ability to purchase large overseas collections by renowned masters. The Victorian Gallery was founded in 1861. It is not actually a national gallery (this is in Canberra), but a Victorian state gallery. However, since it was founded while Victoria was self-governing and before the federation of Australia, the name proudly remains. It now holds over 70,000 art works, one of the largest Australian collections. Entry is FREE except to special exhibitions. This is the main gallery in the heart of the Southbank Arts Precinct in St Kilda Road, housing the international art gallery. Its building is a typical 1960s monster that greets you with a large grey structure and façade. 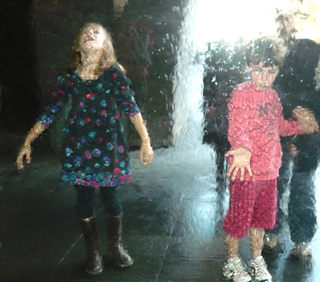 This is broken up by its famous wall of water entrance and the motes in front of the gallery. Inside, in the great hall, you have the worlds largest piece of suspended stained glass  a ceiling that casts colourful light on the floor below. Out the back is a lovely courtyard and sculpture park  wedged between the Arts Centre Spire, Southbanks apartments and the gallery. The iconic Angel sculpture (featured on our home page) used to stand in the mote of the NVG. However, this has been removed and can now be admired along the Yarra towards the MCG. In the international section of the National Gallery of Victoria you can find many international greats, from Rembrandt to Rubens, from the Impressionists to Picasso. There are also collections of textiles, fashion, design, photography, Egyptian and Greek artefacts and ceramics. And there is a section of contemporary international art. The National Gallery holds regular blockbuster exhibitions that have been bringing the best of international art to Australia and Melbourne. There have been the Impressionists from Musee dOrsay, Caravaggio, Dutch Masters from Amsterdam, Picasso, the Guggenheim Collection from New York, Salvador Dali, European Masters from the Staedel, and now the Vienna greats. 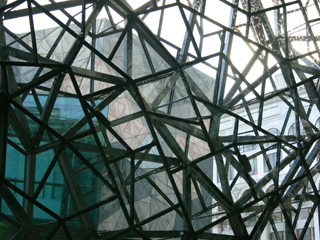 The Ian Potter Centre, the Australian collection of the National Gallery of Victoria, has been housed in Federation Square since his opening in 2003. It pays homage to uniquely Australian art and the Australian art movements and traditions. There was the Heidelberg School that developed its own impressionistic style in response to the developments in the arts in Europe with the likes of Cubin, Arthur Streeton and Tom Roberts. There was the Heide Circle, including Albert Tucker, Sidney Nolan and Arthur Boyd that have influenced not only Australian artists but the world of art worldwide. There are also superb collections of Australian Indigenous and non-Indigenous art from the Colonial period to the present day, and many roving exhibitions of local artists. Art is very alive in Melbourne. This is the place where you can admire the works of art of many other Australian artists  and get inspired into your own creations.